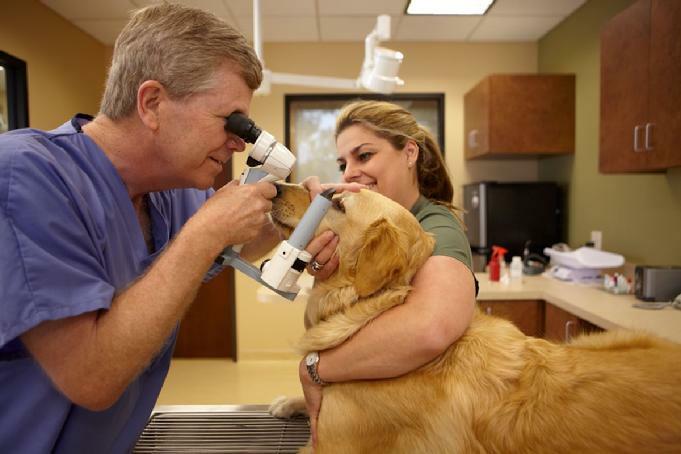 To better serve you, Animal Eye Clinic has two locations. Animal Eye Clinic in Arlington is open Monday-Thursday from 9:00am-5:00pm and from 9:00am-3:00pm on Fridays. Animal Eye Clinic in Fort Worth is open by appointment only. If you do not have an appointment scheduled for an exam or to pick up medications, please call the Fort Worth office at 817-735-1123 before you come to ensure the office is open. When your pet shows signs of an eye or vision problem, you should first make an appointment to see your pet’s regular veterinarian. Often, he or she will be able to treat your pet’s eye, much as your own family physician is able to treat most ailments affecting most areas of the body. Your regular veterinarian can refer you to Animal Eye Clinic when needed, just as your own doctor would refer you to a specialist. After your pets examination, the doctor will discuss the diagnosis and treatment options for your pet. The staff at Animal Eye Clinic will fax a letter to your pet’s regular veterinarian after the examination so your pet can receive the most cohesive treatment possible. Often, your regular veterinarian will perform some standard diagnostic tests on the eyes before he/she refer to a specialist. Regardless of the test performed elsewhere, these tests will be repeated at Animal Eye Clinic. It is important to establish a baseline of ocular health to properly understand and treat your pet. This process is similar to blood pressure and weight measure in the human field. These standard tests are included in the initial examination. Diagnostic testing can often be completed in the room, such as tear tests, fluorescein stain, tonometry (for glaucoma), gonioscopy and nasolacrimal duct flush. Electroretinogram (ERG) and Ultrasound (Sonogram) may also be scheduled when required.